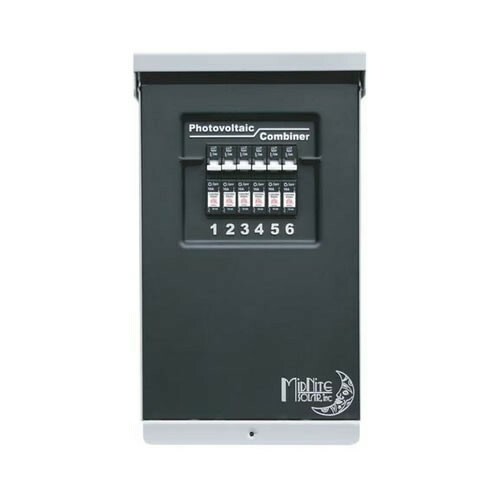 Click the button below to add the MNPV6 - MidNite Solar PV Combiner Box 6 Position to your wish list. Gray aluminum type 3R rainproof enclosure with insulating dead front, will accept six 150VDC breakers or 4 600VDC fuse holders. Includes 15 position PV negative bus bar, 14 position ground bus bar, 120 amp Plus bus bar for breakers and 80 amp bus bar for fuses. Breakers/fuse holders sold separately. Dimensions 8" x 13.5" x 3.5"